If you’re reading this, it means that we’ve arrived safely in Europe for gamescom, and have found a charming café from which to post this transmission. We’ve snuck this very text through French, Belgian, and German borders in an effort to get it to your part of the world, and we’re glad that it too has arrived safely. In the paragraphs that follow, we’ll talk about gamescom, new development tales from the world of Warzone, the adventures that await within pages of a recently released short, and beyond. But first, let’s check in on MCC playlist and content updates. Last week, we talked about the new Action Sack playlist, which is now available in matchmaking for a few weeks. Since its release, it’s been consistently ranked towards the top, and for a few days this past week, it even saw more players than any other playlist. While featured playlists generally draw in a substantial crowds during their first few days, we wouldn’t be surprised to see it continue to do well, and hope that you’re enjoying the wacky and often nonsensical chaos it offers. To see a breakdown of all of the game types included, as well as additional updates that have been made to existing playlists, head here. The playlist team continues to work on future updates, and it’s quite likely that we’ll be talking more about things like Infection in the coming weeks. It’s also quite likely that I will continue to try and persuade the playlist team to put in a Head-to-Head playlist, and that they’ll continue to say “maybe” after a long hesitative pause. 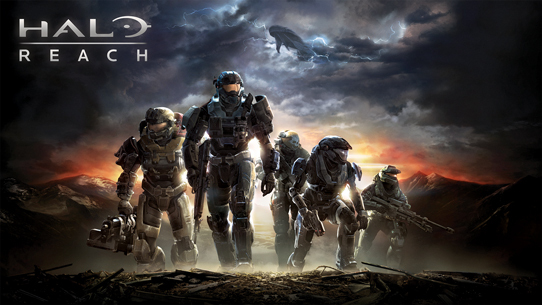 Additionally, the MCC team continues to work on the next content update for the game. We’re continuing to keep a very close eye on your feedback on Waypoint, Twitter, r/Halo and elsewhere, and prioritizing items within the next update based on said feedback. Look for more details as we get closer to the release. The Halo 5 team is busy putting the finishing touches on new experiences – some of which you’ve seen glimpses of, and many of which you have not. The lab schedules are booked with nonstop playtests, which allows people like myself to sneak in and play hours of new Warzone maps in the name of science. There are exciting new battlegrounds being built, weapons being tweaked, tuned, and skinned, and plenty more that we are looking forward to sharing with you in the coming months. Also, many members of the Halo 5 team have packed their suitcases with dedicated servers (literally) in preparation to bring Halo 5: Guardians across the Atlantic for the first time. gamescom, here we come. This coming week, hundreds of thousands of gaming fans will converge on Cologne, Germany, for the world’s largest gaming show. In an effort to beat what will also be the world’s largest crowds, the team is on the ground setting up dozens of stations for the European premiere of Halo 5: Guardians and a the first opportunity for many of you to take to the 24-player skirmishes offered in Warzone. Last year’s gamescom was a special experience for us on the Halo team. As our annual pilgrimage to the other side of the world, it’s our chance to hang with fellow Halo fans we’d otherwise have no chance of meeting. Each day, we’d continue to get new glimpses into the global passion for Halo, thanks to fans and communities like Halo.fr, 17K Group, and many more. Getting to know you and talk about the things you love about Halo is a true treat, and we can’t wait to return this year to see both new and familiar faces. Catch this year’s media briefing – with in-depth looks at tons of upcoming games in 2015 and beyond - live on Xbox One, Xbox.com, and Xbox 360. Xbox Daily returns next week, live from Cologne. The hour-long live show will cover breaking news, exclusives, and interviews with folks who are creating many of your soon-to-be-favorite games. Tune in on Xbox One, Xbox.com, and Xbox 360. As we announced earlier this month, gamescom will be host to the first preview of what’s to come for Halo 5 esports. Featuring four invited teams – Epsilon Esports (EU), Supremacy (EU), CAZ.Esports (EU), and OpTic Gaming (NA), the Invitational will feature a look at two maps: Empire, which was originally featured in the beta, plus Fathom, which was first seen on Conan. Before the tournament, we'll provide you with a closer look at these maps thanks to help from our friends at Prima Games, who just happened to announce the Halo 5: Guardians strategy guide. You’ve likely guessed by now, but I’m excited to say that I’ll have Richard Simms joining me for the broadcast. To watch, tune into Twitch.tv/Halo or the Halo Channel on Xbox One, iOs / Android, or Windows 8.1 and above. Stay tuned for more details on all things gamescom this coming week. We’ll see you soon. Last weekend, another chapter in the history of competitive Halo was written. After months and months of online and LAN battles, Evil Geniuses cemented themselves as the #1 Halo team in the world, capping HCS Season 2 with what many would agree was the only appropriate finish. After losing the first series of the Grand Finals, the gentlemen on EG stormed back, winning three games straight and leaving no questions as to whether or not they were the top contenders at the event. For a full breakdown of the Finals, head over to Xbox Wire, and to catch the Winner’s Bracket Finals, Loser’s Bracket Finals, and Grand Finals VODs, head over to the Halo Channel. These design cues carry into the play experience through the look and feel of the Heads-Up-Display for each character. From a first person perspective, it’s challenging to convey the differences between characters. Having unique HUDs for each of our eight characters allows us to convey a sense of identity and personality through the visual design. Each character’s HUD has been painstakingly designed by our artists to reflect the visual language of that particular Spartan. So Locke’s HUD has aggressive lines that follow the curvature of his visor while Linda’s enhanced optics are represented in muted tones that reflect her armor palette. We’re sure you have questions about the character HUD design - how they came to be, the visual language of each, and more. But, rather than have me guess at what you want to hear, we thought it’d be much more appropriate to have you ask the artists themselves. If you’ve got questions for the team who crafted the HUDs you’ll soon be shooting through, drop ‘em on the forums here, and we’ll get them answered in a future update. Don’t be shy now. For some added background, head to Grim’s Novel Ideas issue of Canon Fodder. 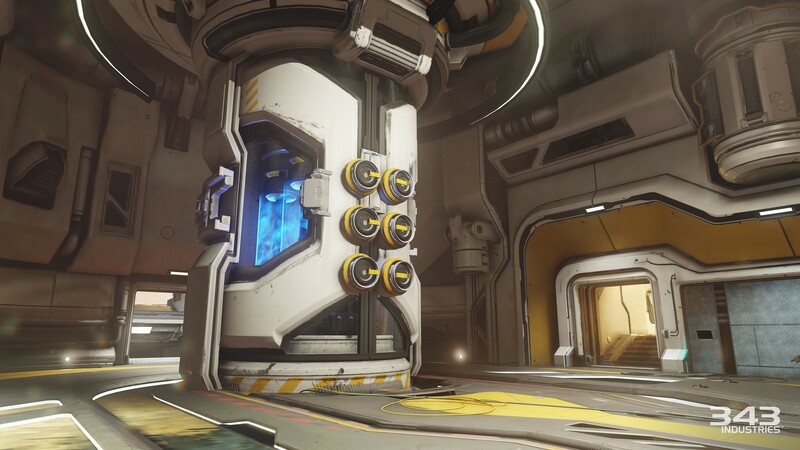 A few weeks ago, we took a look at how the Warzone map Raid on Apex 7 came to be. 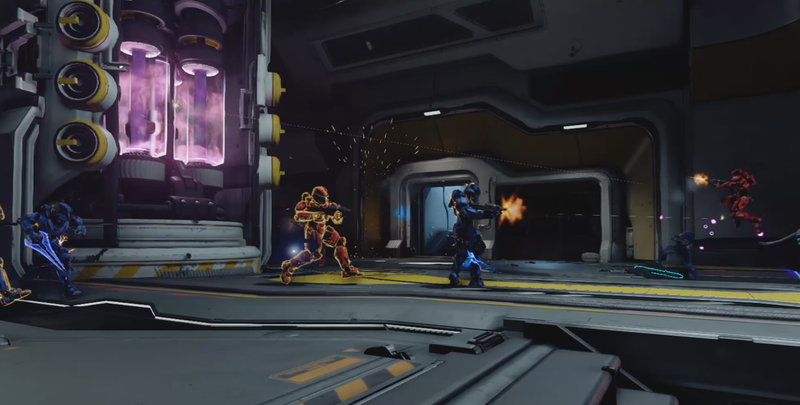 This week, I once again grabbed some time from the gentlemen on the Warzone team, but this time to step back and talk about one of the central features of Warzone gameplay – the Power Core. I realize I could’ve referred to this as a “core” feature for an easy slam dunk, but I absolutely won’t even mention a pun like that. Capturing bases, eliminating AI Bosses, and killing enemy players all award points towards victory in Warzone. 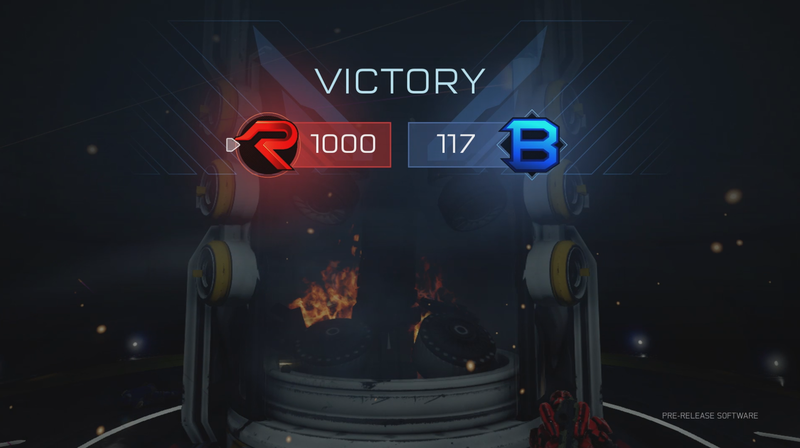 But there’s more to winning a Warzone match than just points. Destroying the enemy Power Core is an instant victory and is an always-present reason to push forward into hostile territory during every Warzone match. Each Warzone Home Base safeguards a destructible Power Core. 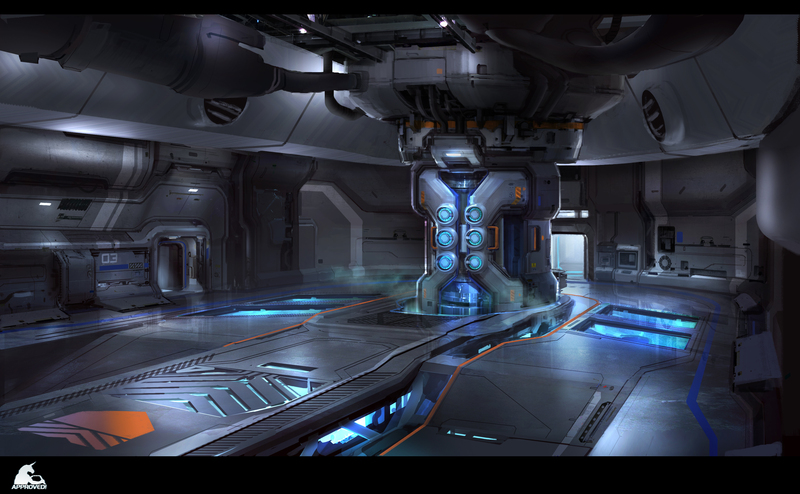 Both teams in Warzone have a Home Base, and safeguarded inside each Home Base is a Power Core. Each Power Core represents a team’s vitality, and it is game over if one of them is destroyed. Shield doors and a protective barrier defend the Power Core from enemy fire. However, capture and hold all three bases on the map and enemy defenses drop, opening up the Power Core to a coordinated attack. Destroy it and be victorious. As you’ll read below, the design and functionality of the Power Core have gone through a variety of changes since development began. To help give some background into the process, where they began, and where they are today, I talked with Lawrence Metten, Sr. Multiplayer Designer, and Adrian Bedoya, Multiplayer Level Designer. Take it away, gents. 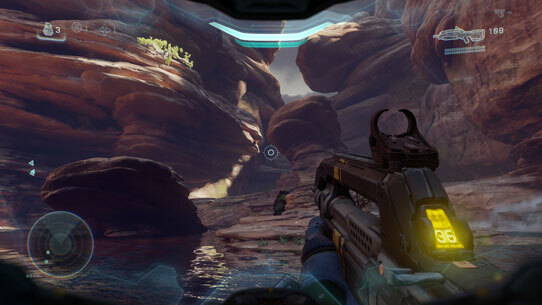 The Power Core was one of the first pieces we tackled when we started development on Warzone. A downfall of base capture modes is what we call a “dead team walking” scenario where one team has clearly won the match but the win condition hasn’t yet been reached. Have you ever played a game of Territories where your team is losing so badly that it’s mathematically impossible to win? That’s a “dead team walking” scenario. Situations like this are frustrating for the losing team and boring for the winners, everyone in the match is simply waiting for the game to end. With the Power Core we wanted to give players a reason to continue to push forward and stay aggressive during the match, regardless of the score. Players can expect epic 12v12 base assaults to end matches that end on a Power Core destruction. 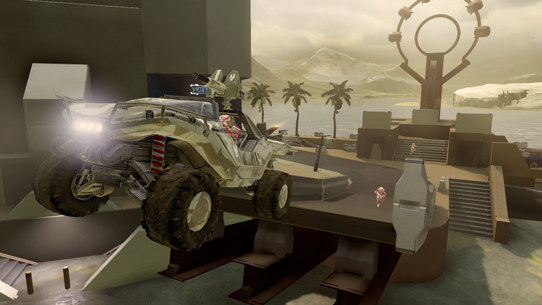 With Warzone we also set out to create bigger battles than ever seen in Halo multiplayer. We wanted to create a system that would facilitate epic match climaxes with all 24 players involved and the entire sandbox of Halo toys in play. The destructible Power Core brings everyone in the match together, whether players are attacking or defending, to create exciting down-to-the-wire match finales. 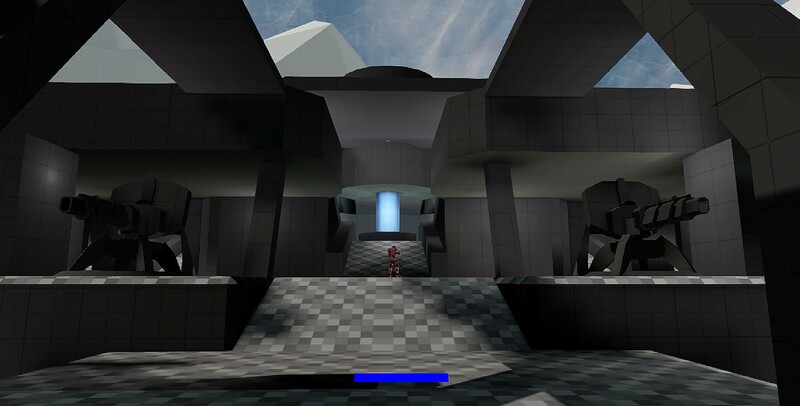 Before we had a playable Warzone map or any of our objectives working there was a Home Base and Power Core prototype. This prototype, which we internally named “Alamo”, was a Home Base in an empty map with three thrown together Fusion Coil Power Cores placed inside it. One of our goals with the Alamo prototype was to try and find the excitement, tension and drama of the last 5-10 minutes of a Warzone match. We wanted to create the point in the match where one team was defending their base and one team was going all-in for an assault to destroy the Power Cores. We simulated this by starting our matches with one team spawning in their home base and the other team spawning just outside the base with vehicles and lots of weapon options available. Back then we had the idea that it would be cool to have a three tiered Power Core that would have to be destroyed using all the different sandbox options Halo has to offer. The top most tier was destroyed using flying vehicles, the second tier would be infantry focused, and the bottom tier would be infantry and vehicle based. The initial idea was to have players form strategies around pushing the Cores at different times, and knowing when was the best time to go for flying vehicles. Games could potentially go down to the last Cores for each team and it would be a tradeoff whether to go all in on attack, or stay and defend your final Core. One of three Power Cores featured in the early “Alamo” prototype. Three Power Cores in each Home Base proved to be too complex and confusing. Warzone Home Bases now feature only a single Power Core. After numerous Alamo playtests we decided that three Power Cores were a bit much and we needed to simplify. The Home Bases were feeling too large and cavernous, with people getting lost and turned around just trying to find the Cores. We scaled down the Home Bases and dropped to a single tier Core to keep the base fights focused. Point scoring wasn’t our original plan for Warzone. Early on, Power Core destruction was the only way to win. 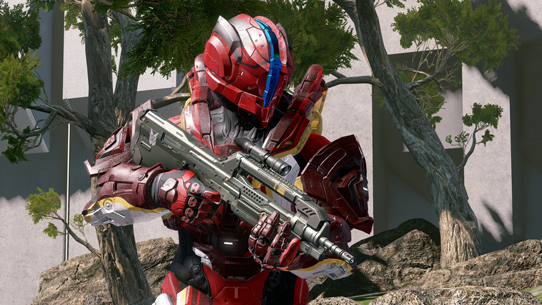 Eliminating Bosses and killing enemy Spartans may award points towards victory now but months into development they were strictly ways for players to increase their in-match REQ Level, gaining access to their full inventory of REQ cards. 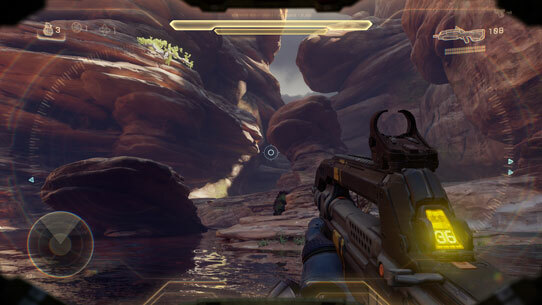 Point scoring came online later in development, rewarding players for completing the full spectrum of Warzone objectives. However, winning the match with a Power Core destruction remains an instant victory and a valid team strategy regardless of the score. Capture all three bases in the field to drop the enemy team’s Power Core defenses. We also quickly learned that we needed to protect the Power Core until players had earned the ability to assault the enemy’s Home Base. 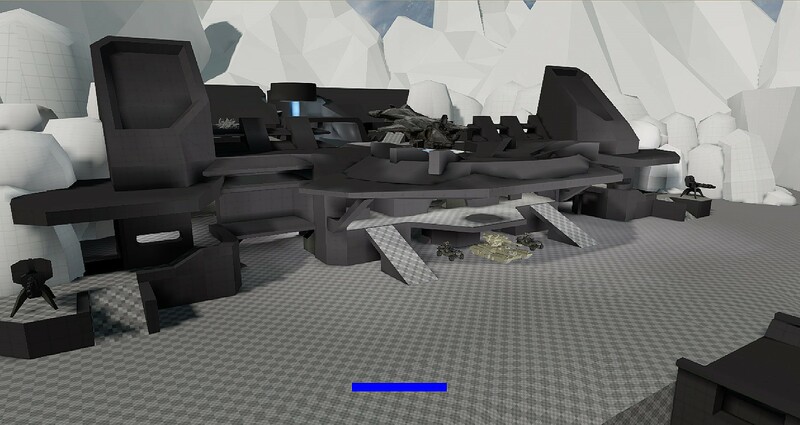 Early Warzone development featured unprotected Power Cores and Home Bases that could be assaulted at any time. Crafty players would rip past the front lines in a Mongoose and blow up the Core, ending the match while the other team was busy in the field. Players in playtests would often hear our designers yelling “no one destroy the power core!” to try and prevent our test matches from ending on a Core destruction in the first 90 seconds. We solved this by placing team affiliated Shield Doors in Home Base entrances and adding a protective barrier to the Power Core. These defenses prevent the Core from being destroyed, but can be disabled by holding all three of the capturable bases on the map, adding a layer on in-match team strategy. Destroying the Warzone Power Core is an instant victory…no matter what the current score. 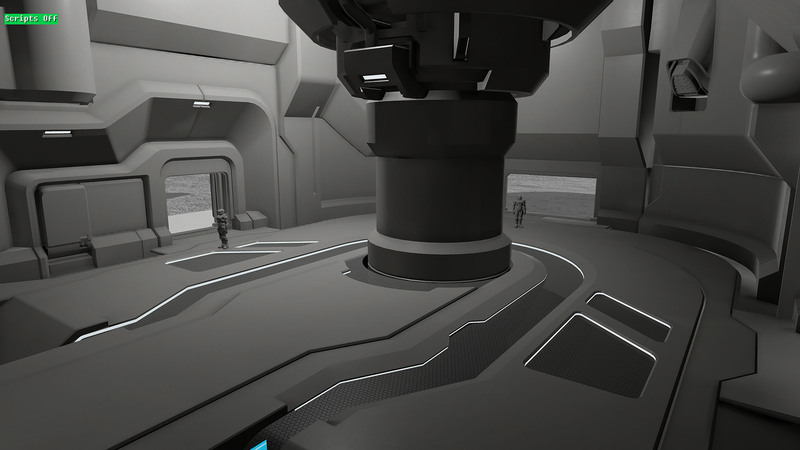 The Warzone Power Core is a constant reason to capture and hold bases and push forward into enemy territory. Not every match ends on a Power Core destruction, but when one does, it’s always after an epic 12-on-12 base assault. The Power Core is an always present way to win, regardless of the match’s score. Don’t ever count your team out in Warzone; you and your teammates are always a Power Core destruction away from victory.